In a heavy nonaliminum saucepan, cook milk over medium low heat, stirring often, just until bubbles appear around edges of pan (do not boil); remove from heat. Add butter and salt. Let stand until butter melts. In a small bowl, combine ¾ cup warm water, 1 tablespoon sugar, and yeast; let stand for 5 minutes or until mixture is foamy. In a large bowl, combine milk mixture, egg, and remaining 3 talbespoons sugar. Add yeast mixture and 3 cups flour, beating at low speed with mixer until smooth. Gradually add 2 cups flour, beating until combined. Add enough remaining 1 cup flour to make soft dough. On a lightly floured surface, turn out dough, and knead for 4 to 6 minutes or until smooth and elastic. Place dough in a greased bowl, turning to grease top; cover and let rise in warm place (85 degree), free form drafts, for 1 hour or until dough has doubled in size. Spray a large rimmed baking sheet with nonstick cooking spray. Preheat oven to 350 degree. Uncover rolls, and bake for 13 to 16 minutes or until golden brown. 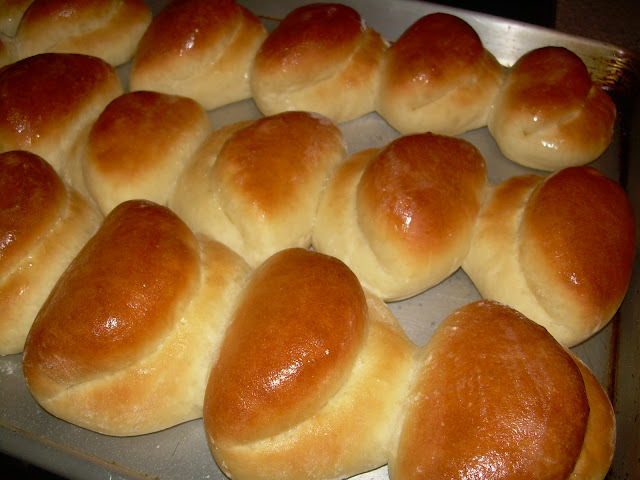 Brush rolls with melted butter, if desired.